Window boxes are the ideal way to create instant mini gardens. Our Georgian window boxes are the ideal choice for a long lasting, durable solution for any window display. Fill them with your favourite pots and plants such as these Busy Lizzies. May is the month for safely planting out without fear of frost damage, so even tender annuals will thrive if fed and watered. If colourful annuals aren’t your favourite plants, why not try scented English lavender such as Hidcote or a classic display of evergreen shrubs such as box – Buxus Sempervirens. 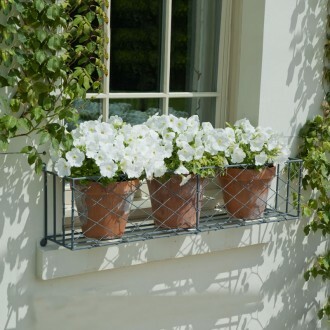 Our window boxes are made by us from solid steel, fully welded, then hot dip zinc galvanized and painted or aged for a very long lasting. Don’t confuse our robust, high quality British made product with cheap imports – we don’t sell through any retailers or garden centres. For more information or made to measure, please call us on 01225 851577.